Brand Finance, a brand valuation firm has come out with its annual Brand Finance Global 500 study, which lists the world’s most valuable and powerful brands. Apple, with $105 billion brand valuation has emerged world’s most valuable brand, whereas Tata is India’s most valuable brand, positioned at #34. Last year, Tata was placed at #39 with total brand valuation of $18.16 billion, whereas this year, it has improved its valuation to $21.1 billion. In the year 2007, when this study was started, Tata was placed at 100th position. 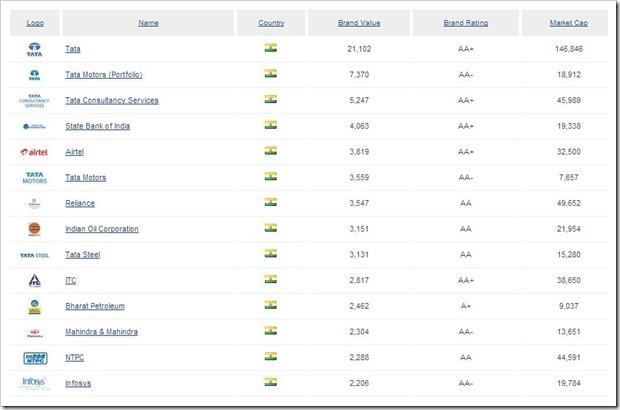 Besides Tata, only 4 Indian companies feature in this prestigious list: State Bank of India, Airtel, Reliance and ONGC. However, all these brands have lost their positions compared to last year. SBI’s ranking has dropped to 347 from 177 in 2013. Its ranking in the Banking 500 has dropped to 54 from last year’s 38. Airtel has also lost its ranking to be placed at 381 this year from 314 last year. Reliance Industries dropped from 172 to 413 this year and IOC ranked 474, from 313. As per the study, SBI’s brand value has dropped from nearly $6 billion to $4 billion, while that of Airtel has increased from $3.74 billion to $3.8 billion. Reliance Industries’ brand value has dropped from $3.7 billion to $3.5 billion and that of IOC from $3.4 billion to $3.1 billion. However, all BRIC countries have fared poorly in terms of number of companies included in the list. India & Brazil has only 5 companies, down from 9 last year. 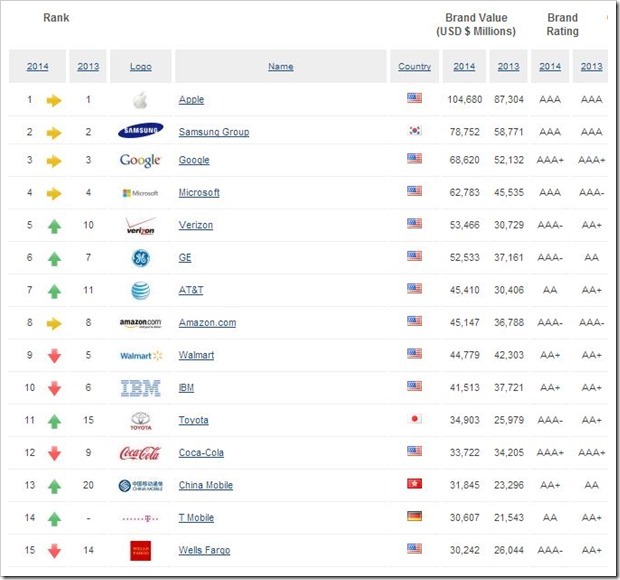 US has maximum number of companies in this powerful list of brand with 185 companies, followed by Japan (42), France (37), the UK (35), Germany (32), China (27) and Switzerland (19), among others. But the ‘World’s Most Powerful Brand’ is Ferrari. Brand Finance’s Brand Strength Index which measures desirability, loyalty, consumer sentiments, visual identity, digital presence and employee satisfaction found Ferrari to be #1 in all these counts. You can find the complete ranking of all powerful and valuable brands of the world here.